Previously, on MinerBumping... 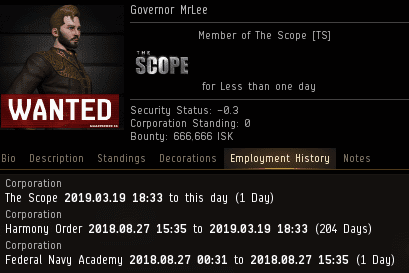 In an attempt to flee the Code's justice, highsec PvE corp CEO Governor MrLee sent Harmony Order into a nullsec war zone. Disaster predictably ensued. Governor was forced to repeatedly apologize to everyone involved. Eventually, Governor grew tired of apologizing over and over again, and he politely excused himself. He could only hope that his groveling had sufficiently calmed the tempers of his corp members. ...It didn't. The next day, Governor received some bad news. Due to one of EVE's quirky little mechanics, the creator of a corporation does not actually own the corp. Ownership is vested in the corporation's shares, which are not assigned to the corp's creator by default. Governor didn't know this--but some of his corpmates did. Aidan Hawking helped himself to the shares. Now that he was in control of Harmony Order, he reflected upon Governor's previous apologies. He found them unsatisfactory. All along, Governor had attempted to project an image of power and respectability by maintaining his silence while in the presence of our Agents. But the truth always comes out. And the truth is the Code. Once again, Governor was forced to defend his many failures and beg everyone for mercy. I've said it many times, and it's more true every day: If you won't pay an Agent 10 million isk, you'll lose a lot more in the long run. Carebears, if you want to live in highsec, mining permits are by far your cheapest option. Everything Governor had built was now in ruins. Yet he was already planning to start over and ensure a miserable EVE experience for the next batch of newbie recruits. Governor was removed from the CEO position and kicked out of his own corp. Such is the fate of all who would oppose the Code. ...They tend to be persistent. After all, when you provide nothing of value to your corp, it's easy to form another one and try the scam all over again. The downside, of course, is that the mighty CODE. alliance already knows your name. 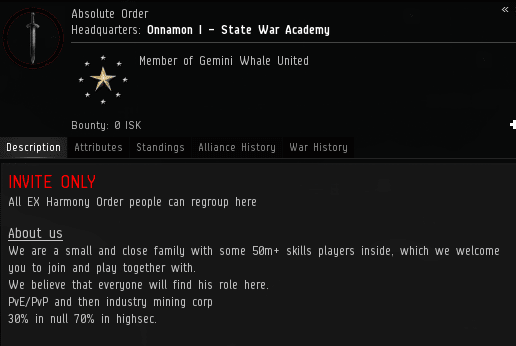 Fear not: Our Agents will never stop fighting for the good of everyone in highsec. James 315 posts every day. Are you saying it's not enough? You'd like to read more? Then you aren't as a hopeless idiot you try to appear around here. He's got a really unhealthy obsession with us. Probably because we ganked him while watching basketball. "Did it really take you 12 lame installments"
It sure kept you on the edge of your seat. If you truly have an issue with it, you could try visiting the hisec militia blog that no one reads. They have a blog?!? Do they post stories and videos of failing non-stop daily? What an epic tale. The agents are true heroes. Especially the agent that went undercover to show us the dark rotten underside of that evil corp.